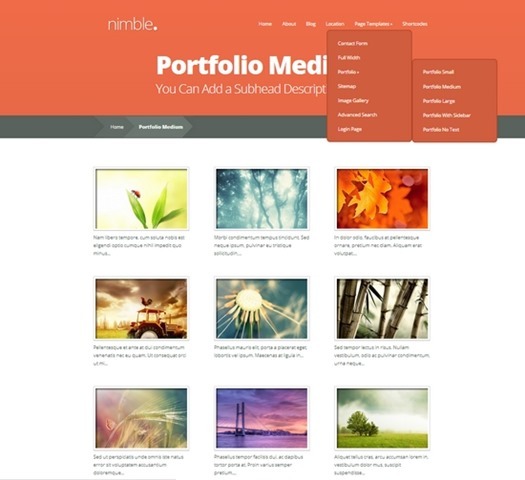 With a business portfolio theme for WordPress you can quickly have a professional online presence set up set up for your business. Today I am looking at Nimble, one of the new well-designed and colorful business portfolio themes that I immediately fell in love with. I am sure you also will like it! 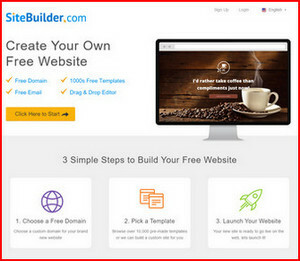 When building a new website it is certainly possible to start from scratch. However, while giving you complete flexibility it may also be the most costly and time consuming. The trend right now in web design is to rely on open source platforms like WordPress and kickstart web design projects by using a WordPress theme. One of the most important things make sure, besides finding the right look and feel, is to get an idea of what features you need long term. 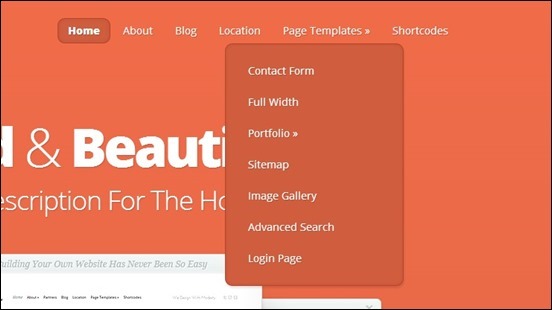 Some themes comes with a lot of flexibility and allows you to build advanced pages without diving into the code level. In most cases this type of theme is recommended for business websites, as your needs develop as your business grows or change. Now with thousands of themes already available and many new released daily how do you find the right theme? I believe Elegant Themes have a unique proposition. They have some of the best premium themes on the market and give us access to use all of them for half the price of most premium themes. 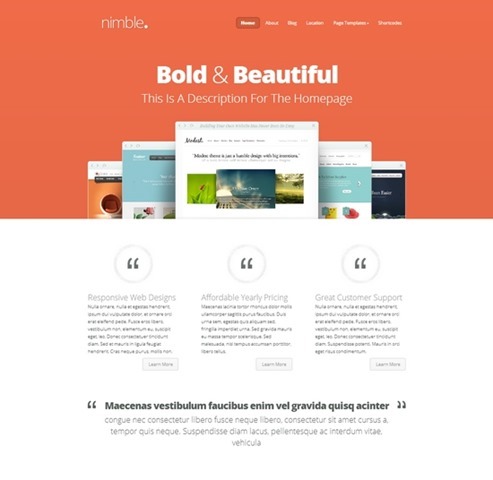 Nimble, one of their recent themes, really stand out with a colorful and bold look and feel. The theme is of course fully responsive and give visitors accessing your website via mobile devices a great experience. The default color palette in the design is orange but you have the option to choose from great color palettes such as Blue, Green, Red or Gray. The homepage design is pretty cool as each section have separate colors. 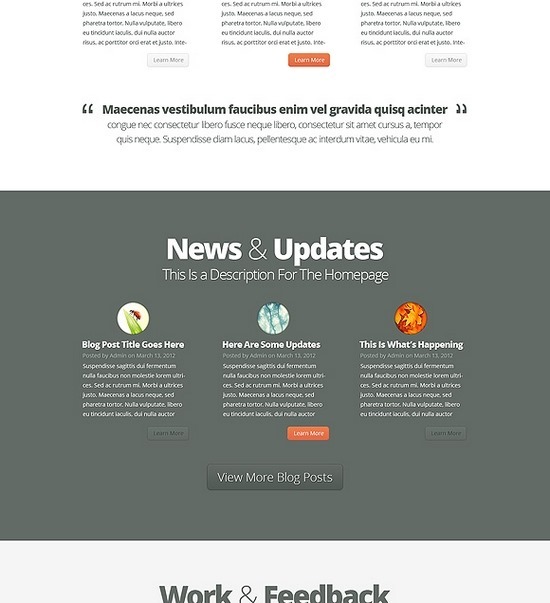 This is a design approach often seen in single page WordPress themes (check my previous post for inspiration), and in Nimble it helps building a content heavy front page without making it hard to digest. OK time to have a closer look at the theme. I am going to show you some of the most important features to look out for. In addition, please take a minute to drop a comment and share the article with your friends on social media if you like it! First lets have a look at the Front page design. Notice the dynamic full width slider that perfectly fits the header and the way sections are seperated with different colors. Here you see the way sections are perfectly seperated using different background colors as often seen in one page website designs. Nimble has several built in pages for starters to pick on. 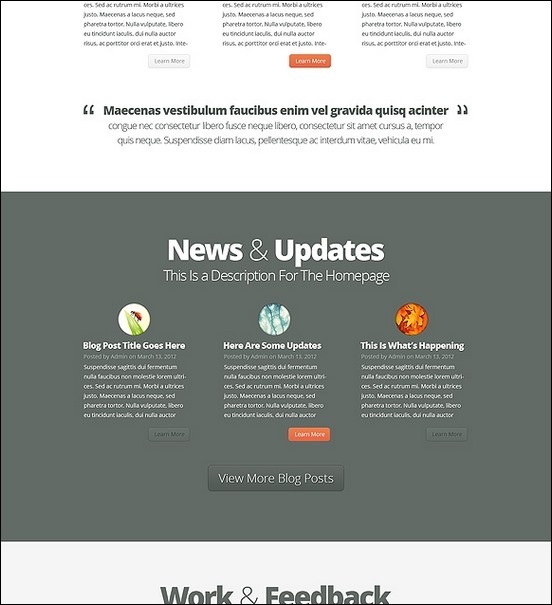 A well constructed about page, blog page and several page templates are readily available from the theme.You should go visit the theme demo as all the tempaltes are included as examples. 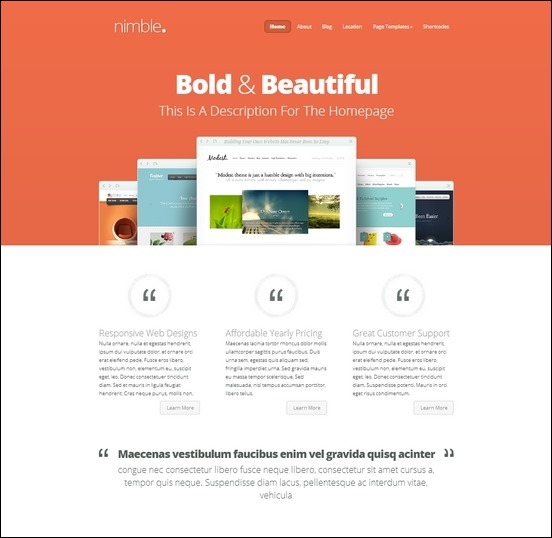 Nimble demos of page templates. 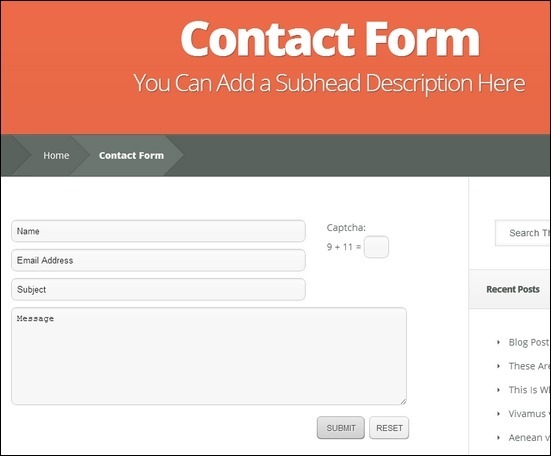 Here’s a sample of Nimble’s contact form. It looks plain but has the necessary fields and a captcha text included to protect your website from spammers and bots. In addition, the number of portfolio page templates are pretty comprehensive when it comes to the possible options for the design. The designers have included 5 Portfolio styles. This would greatly be an advantage for freelancers, photographers of for anyone who wants to showcase their work. 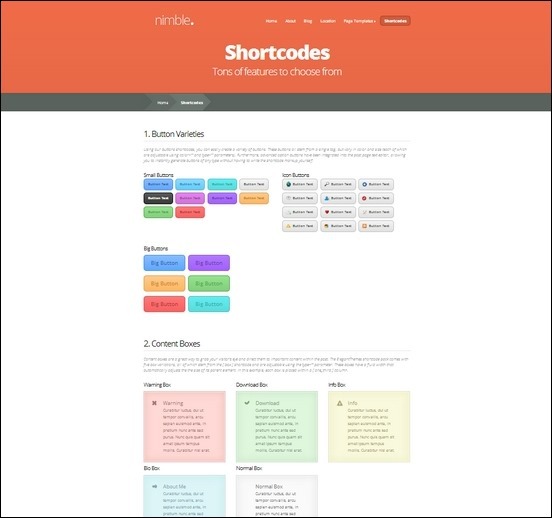 Another great feature of this theme is the native support for shortcodes. 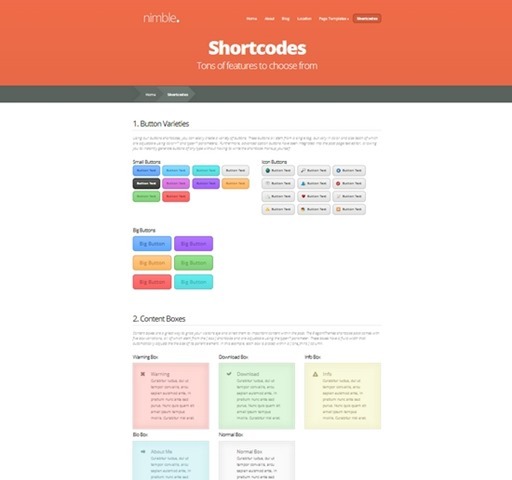 The shortcodes are within Nimble’s core files, so no additional plugins for them to be working is needed. 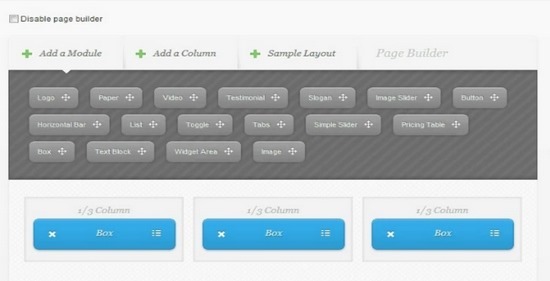 You can choose from a variety of shortcodes including content boxes, buttons and other essential web elements. In addition, the page builder plugin from Elegant Themes wil give you extreme flexibility and make it easy to create even complex pages using the drag and drop UI. You can then fully customize a page and add many different page elements without coding. I personally recommend checking out this theme. It may have its limitation due to the simplicity imposed by the theme but overall this is a premium that you should not miss. You can check out a live demo of the theme here. Do you know of any websites using this theme? Will love to see it in action (other than the demo). Thanks! As a former customer, I highly recommend Elegant Themes. Tight code and really helpful support. They always do a great job. Nice work on the writeup!